It's just after midnight and we're at the Chinese-Mongolian border. In fact we've been here for 3.5 hours already. 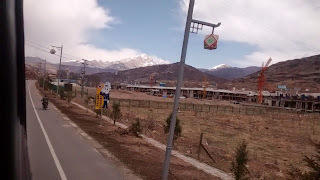 We've been through Chinese immigration and customs procedures but will still need to go through the Mongolian equivalents once the train physically crosses the border. 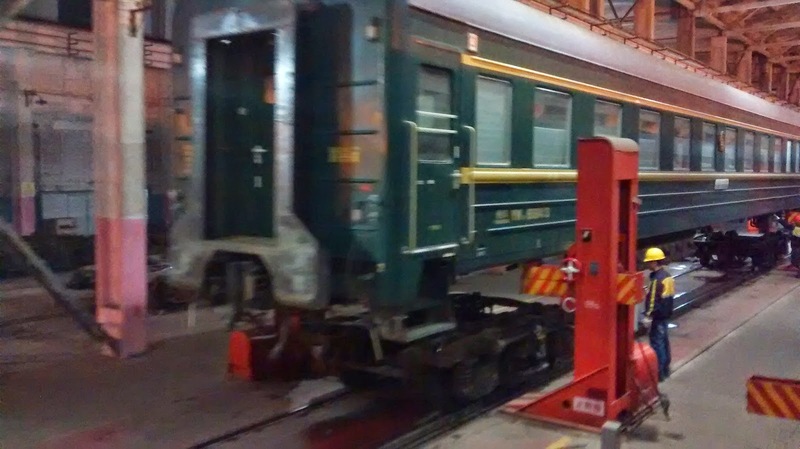 In the meantime, aside from a lot of sitting around, we've been having our bogies changed: Chinese railways use a different gauge than those in Mongolia and Russia, so they have to split all the train carriages up at the border, jack them up, and change the wheels before reassembling the train with a new dining car in the middle. It's all pretty smooth—procedurally that is; the train has been jolting back and forth incessantly as they shunt the carriages around—and was quite interesting to watch through the window. Apparently the whole border-crossing process can take up to 6 or 7 hours, but we're hoping it will be less tonight because the train is nearly empty. It must be 12 carriages long but I only saw about 60 people waiting to get on in Beijing and each carriage only seems to have about a half dozen people in it. It makes a nice change from our last overnight train. This marks the half way point of our trip in terms of time, but we're also moving on to the third of four main countries we're visiting, which is pretty exciting. 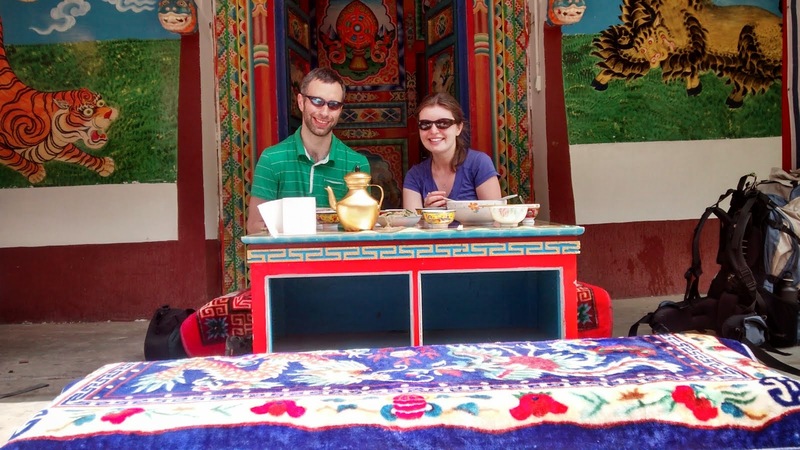 Time's whizzing by awfully quickly now but we've had a great time in Beijing—Ruth's working on another post—and are really looking forward to our adventures in Mongolia. 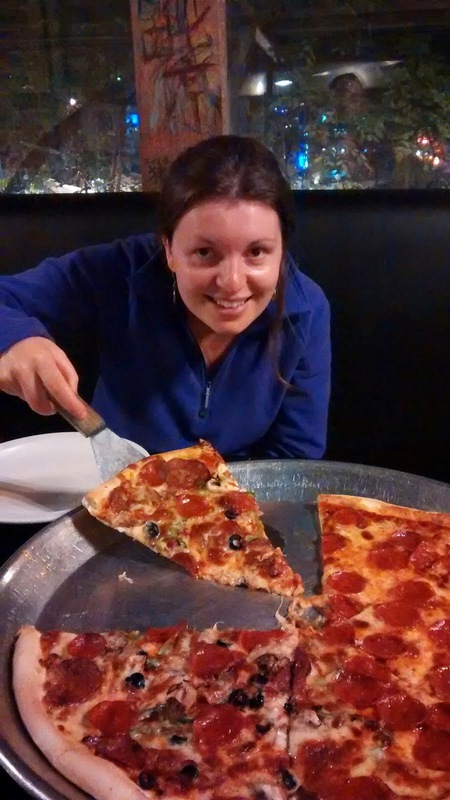 We've successfully addressed that cheese craving from last week. That is all. We've cracked. We were trying to stay strong until Beijing, but the cravings for western food were too great. What I want most is beans on toast, with a little bit of cheddar cheese and a splash of Lea and Perrin's, but the chicken burger and fries we're currently munching are a good alternative. That was until last night when we tried 'hot pot'. We had the good sense to choose the medium spice level, and good job because it was very much like the name suggests - HOT! It was basically a pan of chilli oil with extra chillies, a chicken (including the feet) and potatoes. It's served with a bowl of spring onions and you'll never guess, more chillies (see photo below - and don't be thinking we were drinking giant beers, they serve beers with the tiniest glasses/cups). It was only halfway through Julian pointed out it probably wasn't the smartest meal to eat before a 12-hour bus journey. 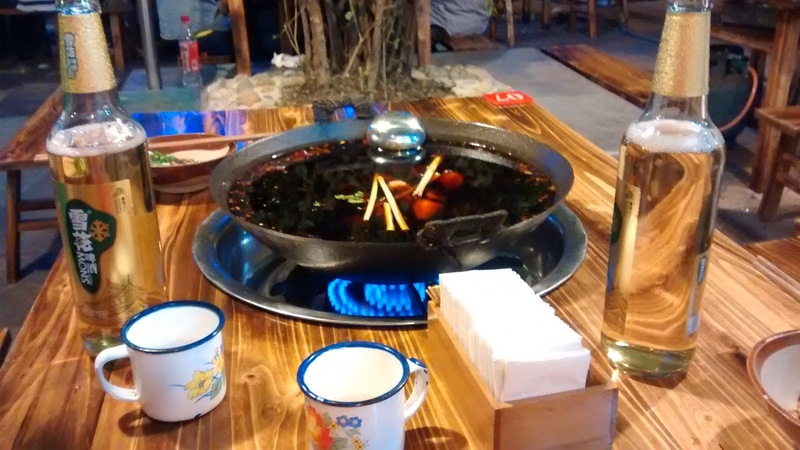 But we made it to Xi'an without any mishaps, and now we've had a fix of western food are looking forward to sampling what culinary delights Shaanxi province has to offer. Well it had to happen... everything's been going smoothly but as we sat down a couple of days ago to figure out our journey onward to Xi'an and Beijing, we discovered all the trains—there are a dozen or more trains a day but they serve a population of 1.3 billion—were full for days! 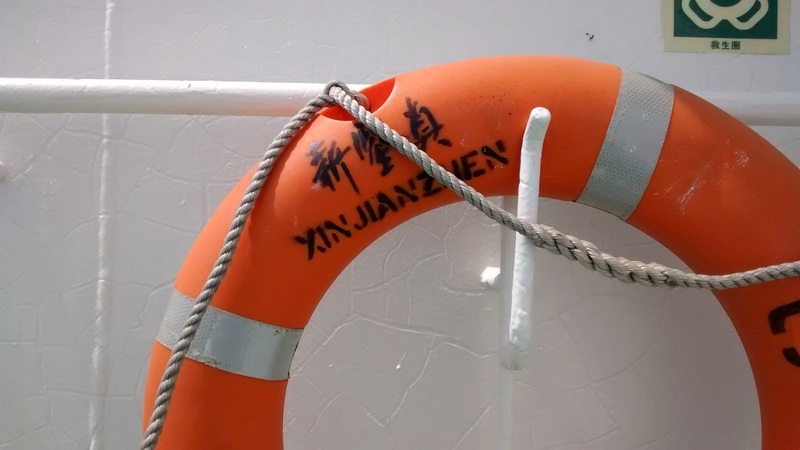 Since we couldn't get full details or make travel bookings without getting back to civilization, we also couldn't book accommodation and the hostel in Chengdu, which was nearly empty 5 days ago, was suddenly nearly full. We arrived back late yesterday afternoon and, after whizzing around to train and bus stations and our first night in a shared dorm, we've managed to get things back on track. We're now whipping along a very good divided highway, past lovely scenery, on an 11-hour bus trip, actually shorter than the train would have been. every Starbucks suddenly becomes an Internet café, much much nicer than any of the dark, dingy places I frequented for an hour or so every few days last time I did this (and I don't need to worry about shared computers capturing my passwords). So that's been amazing, and I didn't expect things to have changed so much: I nearly didn't bring my phone. 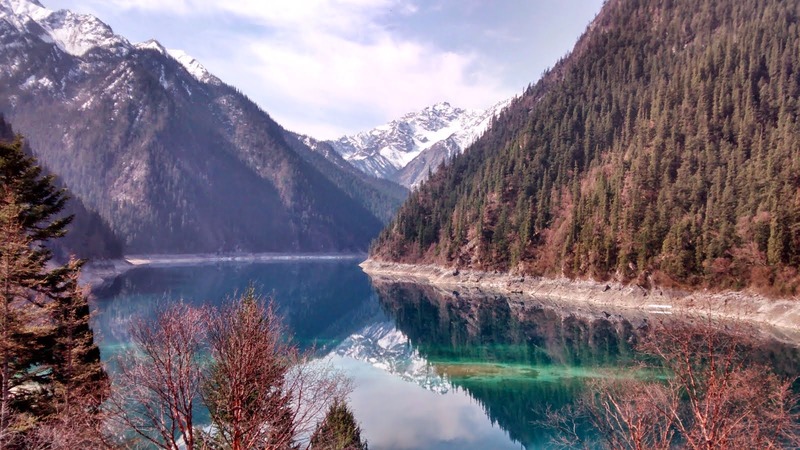 We're just back from a 2 day hiking trip in Jiuzhaigou national park. 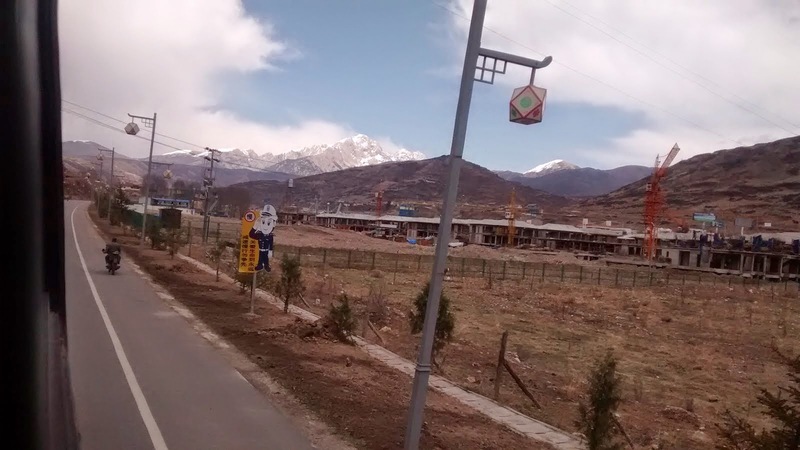 The park is in northern Sichuan and ranges from 2100 to almost 3500 metres in altitude. It boasts an incredible landscape of glacial lakes and forests, surrounded by imposing mountains well over 5000 metres high. For hikers, the catch is that it attracts around 5000 visitors a day, the majority of whom spend the day squeezing on and off the packed buses that run through the park. With such a high number of visitors, you're only allowed to walk on the boardwalks. The only way to hike properly in the park is through an eco-tour company that offer hikes in the Zharu valley. They only take 300 people a year into the valley so it's unspoilt. Interestingly, none of the hikers are Chinese which we found surprising given that 99% of the visitors to the main park are Chinese. The hike was pretty tame as it was mainly through forest but it was worth it to have a couple of days of tranquility - China is the noisiest place I've ever been. 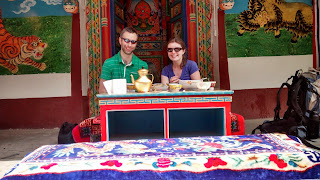 It also gave us the chance to try some Tibetan food as we stopped for lunch in a Tibetan village, and to learn a few more mandarin words as our guide didn't speak much English. Continuing my food theme, cheese isn't popular over here and it's the thing I'm craving right now as we wind our way up this dusty valley in northern Sichuan. We've been in China for a few days now and we've had some delicious food. We started off in Shanghai by stuffing ourselves at Beyond the Clouds—thanks Steven!—a Yunnan restaurant. For less than 200元 (about £20) we had a couple of large bottles of beer and probably enough food for four: soft tofu in a spicy sauce, aubergine in a sticky delicious sauce, beef with wild mushrooms, some kind of green vegetable, black wood ear mushrooms, and rice. That's fairly upmarket though: yesterday for lunch we had bowls of spicy pork Dan Dan Noodles at a hole in the wall for 7元 (70p) each. 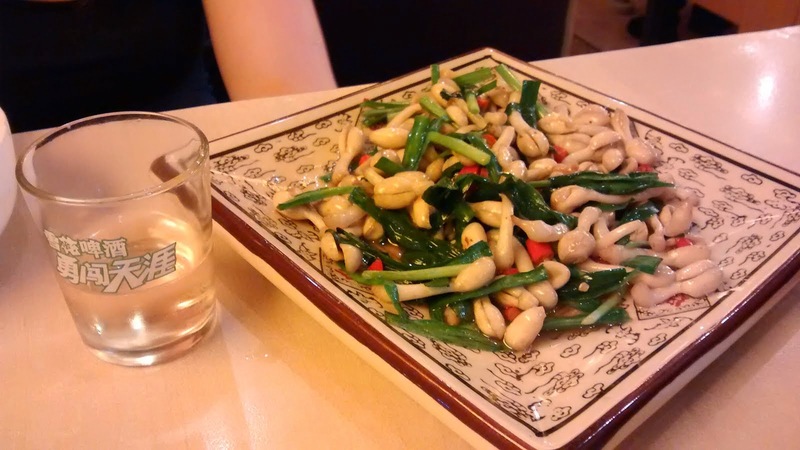 We've had delicious Sichuan spiced aubergines and some tasty peanut-like and—see the photo—curiously-shaped bean sprouts. All this to say that there's no shortage of amazing food but—and I've noticed this even when traveling for extended periods closer to home—I can eat a lot of dinners out but sometimes you just want a yoghurt or a cheese sandwich for lunch. And I find breakfast the toughest: I don't really want raw fish or pickled vegetables for breakfast. I don't even really want an English breakfast after a few days. I really just want a slice or two of toast and maybe a cup of tea. Yesterday we went to the panda breeding centre and successfully boosted our average daily photo count by a fair margin. Despite being millions of years old as a species, pandas don't seem to be particularly effective breeders, particularly in captivity, so the centre has been doing a lot of work to improve the breeding program to help boost their numbers. Survival of babies is now close to 100% and released pandas are apparently doing well. Bringing it back to food again, pandas are also not particularly effective at digesting their daily diet: they were originally carnivorous and their digestive systems have not really evolved. As a result, they can only process about 20% of the bamboo they eat. This means they need to spend a lot of time eating! Last night, trying to be efficient myself, I used hand signals to indicate we wanted a table for two. In China, they have a series of signals to represent 0 through 10. As they led us to a surprisingly large table and began setting places for 8, I suddenly realized that I had forgotten the details and used the wrong sign. Trying to correct myself just resulted in the drinks menu being brought so we had to fall back on pointing at relevant lines in our phrasebook. 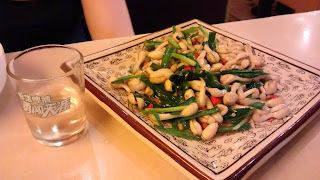 This meal was actually or most difficult ordering experience to date and, though I ordered a particular Sichuan chicken dish I knew, we ended up with chicken and chestnuts. I like chestnuts but have only had them roasted in small bags; it turns out you can only eat so many... they're filling! By the way, I apologize for the lack of formatting and links. We can't access Blogger through the Great Firewall so are having to submit by email. This also means I'm showing as the author of Ruth's posts. Hopefully you can work it out. 23 hours into the ferry journey and I'm slightly bored so thought I'd write about one of our evenings in Tokyo at the Golden Gai. The Golden Gai is on the edge of Shinjuku, one of Tokyo's main nightlife areas - and home to the red light district. Tucked in behind the high rise buildings with their neon lights is a series of alley ways lined with ram shackled tiny wooden buildings, no more than two storeys high, each no wider than a caravan. These buildings are home to tiny bars and restaurants, most of which are exclusively for regulars and unwelcoming to foreigners: at one point we saw a Japanese guy knock on a door, give a password and the door momentarily open to let him in. But a few places do let foreigners in and we were in search of Albatross G (thanks for the recommendation Sara - it's still there). In the end we went to a ramen noodle place; you had to buy a ticket for your meal from a vending machine then queue outside down a dark alley, getting funny looks from people walking by (most of whom ending up joining us in the queue, probably because they assume if there's a queue it must be for something good). When there were spaces available the waiter ushered is up the stairs into the tiniest restaurant I've ever seen. There was "room" for about 8 people at once on stools crammed between the bar and back wall, with the kitchen on the other side of the bar. I'm not sure how Julian managed to fit... He looked a bit like Gandalf in Bilbo Baggins' house. I'd like to say they were the best noodles I've ever had; all I'll say is they were the fishiest noodles I've ever had. But it was an experience to remember. I awoke this morning to an impressive roar. I guess more accurately I reawoke: I had first been roused at 6:30 by our cabin mates stirring and it took a while to get back to sleep while trying to block out the sounds of someone retching in another room. Whether it was brought on by seasickness or alcohol mixed with too much karaoke I'm not sure; we left the shelter of the Seto Inland Sea around midnight last night but the sea is still calm. We're still near the islands west of Nagasaki but the next land we see will be China. So I awoke again to the sound of an angry mob, people having a shouting argument, a crowd cheering on a sporting match, and a rowdy game of charades all rolled into one. Or so I thought. What other explanation could there be for the level of noise being generated this morning by our fellow passengers? When I got up to have a look though, all I could see were people sitting round tables, chatting away, and waiting for breakfast. Determined to get some more sleep--it was only 7:30 and there's no need to make a long day on a boat even longer--I stuck my earplugs back in (honestly, they barely helped) and... the public address system kicked in. Long message in Mandarin. Long message in Japanese. Finally, the message in English: "Ladies and Gentlemen, the Information Desk is open. You are welcome to use it." At 7:30 in the morning? Ruth and I are working our way through our Japanese themed literature at the moment: Eric Lomax's The Railway Man, Ruth Ozeki's A Tale for the Time Being, and James Clavell's Shogun, all based on recommendations from friends. I have the advantage, having already finished Clavell's gripping 1000-page novel about Samurai culture last year. I think Ruth's currently trying to read two books at once. I think we've found all three have been interestingly informed by our week in Japan and vice versa, actually: Shogun added to our appreciation and understanding of Bunraku performance in Osaka. We're currently on the ferry between Osaka and Shanghai; we're two of three westerners on board and get peculiar looks from most of the passengers. Why I'm not sure: they are the ones jogging round the canteen and singing karaoke in their pyjamas. It's going to be a long 48 hours. Apart from the food, there have been a few other highlights of our week in Japan and our trip to the National Bunraku theatre in Osaka was definitely one. Bunraku is a form of puppet theatre with three-quarter scale puppets each controlled by three onstage puppeteers, and along with Noh and Kabuki is one of the main forms of theatre in Japan. We just went to the second half of the performance, which was still 5 hours long! It was an enthralling story about Samurai, with love, betrayal, deception and sacrifice as the main themes. Within an hour the puppeteers had disappeared from our consciousness and all we paid attention to was the puppets who moved with such grace and precision that they seemed renal. The narrative is told through a mixture of singing and chanting by a musician who sits to the side of stage; for the first twenty minutes it was really grating and I thought it was going to be the longest 5 hours of my life, but the skill of the narrators in conveying the emotion of the puppets was incredible. Highly recommended if you ever get the chance - it's as good as Avenue Q, but very different!! We've had some terrific food in Japan so far. One highlight was a bento box picnic enjoyed with thousands of tipsy locals under the cherry blossoms in Ueno Park, Tokyo. Hanami, or cherry blossom watching, is an important event during the few weeks in spring when the blossoms are in bloom. The national weather service provides bloom forecasts and junior employees are sent in the morning to lay out blue tarps and claim precious space in the parks before they fill with people walking, photographing, drinking, eating, and enjoying each other's company. The blossoms are a pretty powerful symbol for the fleeting beauty of life. Another delicious meal was traditional Japanese tapas-style pub food shared in a small bar with a Japanese friend in Tokyo and some friends of a friend visiting from Norway. We munched on grilled skewers, a pork stew, and edamame beans and washed it all down with beer and huge glasses of plum wine and sake--they pour until it overflows into the saucer because if it's overfilled it can't be underfilled! Also in Tokyo, we had Ten Don--massive fried prawns on rice--at a tempura restaurant, seated with our shoes off on tatami mats. And in Hiroshima we enjoyed Okonomiyaki, a local creation consisting of a savoury pancake piled with layers of noodles, cabbage, bacon, cheese, green onions, fried egg, sticky sauce, and unknown secret powders. You sit around the edge of a giant grill and the food is cooked in front of you and served on the grill just by sliding it towards you. Amazing! Don't knock it 'til you try it. It was all going well until last night when we accidentally ordered the house special: offal stew. It wasn't as awful (ha!) 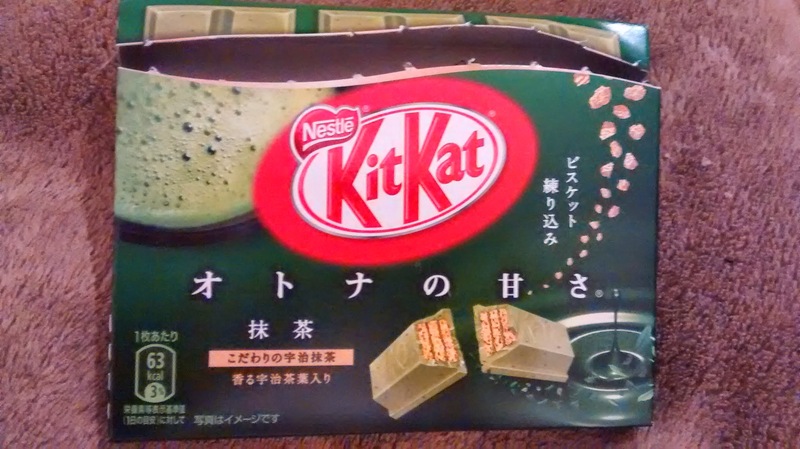 as I expected--Ruth disagrees--but my imagination wasn't happy with it and after working my way through about half I was keen to settle it with something more normal... like matcha-flavoured Kit Kat of course; it seems there are all sorts of odd varieties here to try. I still need to get a good sushi fix and we're on a Ten Katsu mission tonight.